Mert F. Buckley | Adams Jones Law Firm, P.A. Mert has practiced real estate and commercial law with Adams Jones since 1977. He has negotiated and closed transactions for clients acquiring, selling, or leasing many types of properties, including office, multi-family, industrial and retail properties. His experience ranges from hotels, shopping centers, medical offices, wind farms and churches to doughnut shops, office buildings, and a country club and golf course. 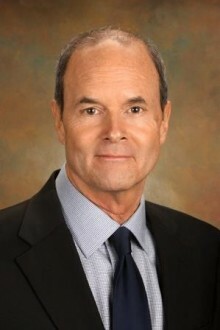 He has also represented local and national lenders for many years. This work includes loan documentation and closing loan transactions. He also represents lenders in commercial foreclosures of income-producing properties and has written and spoken on this subject for state and local bar organizations. Mert’s practice also encompasses construction work, including recovery of claims for contractors under mechanics’ liens. Represented hotel developer of five major franchised hotels ranging from $7M to $12.5M. Along with other Adams Jones attorneys, served as local counsel for lender on largest wind farm in the state, involving 250 tracts of land in 4 counties. Represented purchaser of historic Union Station for future development. Assisted real estate broker to comply with state licensing act and broker laws (Brokers Relationship in Real Estate Transaction Act). Aided client in approval of first Community Improvement District property under construction in Wichita. Represented more than a half dozen medical offices to relocate and build new offices. Assisted purchaser of non-performing and other troubled loans from failed institutions and similar sources. Represented lenders in commercial foreclosures of office buildings, residential building lots, and other commercial properties.